The Old McDonald Speedee Hamburgers Neon sign is a unique piece for sure. 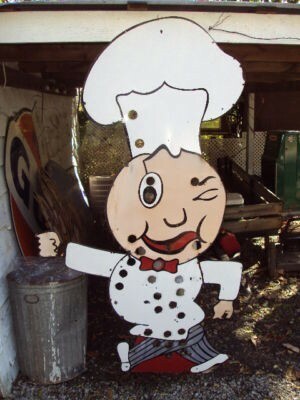 This sign is die cut in the shape of a Chef, complete with his tall white hat. The chef is wearing a white jacket and grey striped pants. If the sign you have does not have the neons in it, then there will be holes all over the sign. But, when it comes complete with the neons, it will light up quite nicely. This sign is 44″ wide and 77″ tall. The resturaunt that this sign was used for is located in Panama City, Florida.